This authentic beef teriyaki recipe from scratch comes together from only 5 ingredients in a matter of minutes. 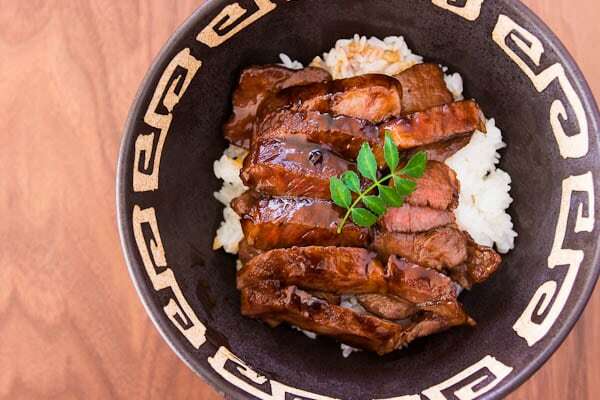 With tender beef seared and glazed with a glistening sweet and savory teriyaki sauce, you can skip those expensive bottles of pre-made sauce. Unlike its sibling chicken teriyaki, you won’t see beef teriyaki much in Japan. Like the California Roll, it was likely cooked up by a clever chef in the US trying to lure in more local patrons. In Japan, teriyaki sauce has a longstanding monogamous relationship with chicken (except perhaps the occasional fling with yellowtail). If you mention “beef teriyaki” there, your query will likely be met with curiosity about the “Japanese food” served in the US, rather than indignation as you might find in some countries. That’s probably because some of the best “Japanese” food started off as a knock off of another country’s dish. Tempura(Portugal), ramen(China), and tonkatsu(US) are all perfect examples of food that made a journey from another country before becoming something uniquely Japanese. That being said, I’ve seen one too many generic strip mall Tom’s Teriyaki joints try and conceal tough flavorless beef by overcooking it and smothering it with a cloying sweet sauce that’s been thickened with cornstarch. It really gives teriyaki a bad name and I decided something needed to be done to set the record straight. So I put on my “what would a Japanese person do” hat and went to work. The first thing I decided was that a Japanese person would definitely start off by buying a ridiculously overpriced cut of meat that was fed on a diet of white truffles from Alba and bottles of 1945 Chateau Mouton-Rothschild while being massaged by 40 year old virgin sumo wrestlers. Well… okay, maybe I’m exaggerating a little, but I went and bought myself a nicely marbled ribeye. Contrary to traditional wisdom (that thicker steaks are better), when you’re making beef teriyaki thinner steaks actually work best because you have more surface area relative to the amount of meat for the sauce to cling to. If the meat is too thin though, it will be well done by the time you sear it and get the sauce nice and thick, so I find 1/2″ thick steaks to be just about right. As for the sauce, the teri in teriyaki literally means “shiny”, so adding garlic/sesame/ginger/scallions/etc. that would cloud the sauce is off limits. I make my teriyaki sauce with the golden 1-1-1-1 ratio of sugar, mirin, sake, and soy sauce. Yep, there’s no cornstarch! The sauce is thickened by the sugars caramelizing, which broadens the palette and allows it to coat the meat nicely without being heavy or cloying. 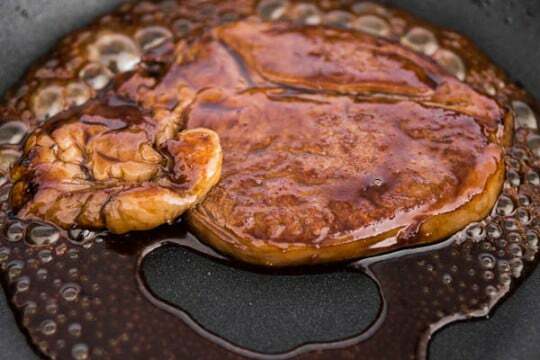 While I use honey as the sugar in my chicken teriyaki sauce, I prefer using brown sugar for my beef teriyaki. It creates a darker sauce with deep earthy flavors. Personally I love the way the dark caramel flavors of the sauce interact with the rich savory meat, so I don’t add any ginger or garlic, but if you want to add another dimension to this dish, you can rub some grated ginger or garlic onto the beef before frying. The beauty of beef teriyaki is in its simplicity. Provided you can find sake and mirin in your area (many grocery stores carry them in their Asian food section these days), the list of ingredients is simple, and the preparation is even simpler. A quick sear on both sides gives it color, and the steak finishes cooking while the teriyaki sauce reduces in the same pan. 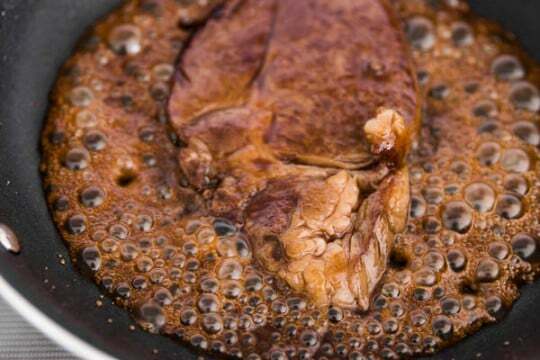 If your steak is very lean, rub a teaspoon of oil onto each steak. If the steaks have a lot of fat marbled in with the meat they shouldn't need any oil. Heat a heavy bottomed frying pan over high heat until very hot. Add the the steaks and sear one side until browned. My dad adores beef dishes. He’ll definitely love this Asian flavor in beef. Thanks for the post! Looks really delicious! wow this looks scrumptious! I love anything teriyaki! Oh my, what a gorgeous piece of steak you have. Delicious! Yum! Your beef teriyaki looks fantastic! I didn’t know that “teri” means “shiny” – I’ve always added green onions and sesame oil to this sort of recipe. I’ll definitely bookmark your recipe to try out the next time I’m making teriyaki! Thanks for sharing! Marc, the Beef Teriyaki was de-li-cious ! so easy to make. Came across your blog by chance … you have a new fan . The recipe is delicious. I love how easy it was to make the sauce. Ok Marc, I tried this recipe and my hubby said “tastes like beef teriyaki”! Yes! I did it! Been trying to make this using other’s recipe but I think I did it this time with yours! Thanks and more power to you! Just one but, the ribeye steak is not nicely marbeled there is way too much fat comparing to muscle. Surely you will have much more juicy and tender meat but you will loose a lot of beef flavor. It is not what its called perfet marbled meat. I think that here in Europe (where I live) it is also impossible to buy japanese beef. Nevertheless I do have access to very special Spanish beef. 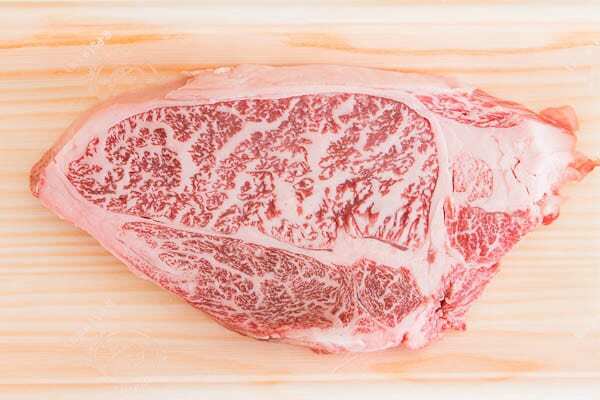 You should try it also one day, although it hasn’t got the marbling level of Japanese beef, it has an extraordinary taste (and experts say it is very well marbled, too). I haven’t tried much Spanish beef, but I live Iberico pork! No wonder, most of true Spanish beef is not exported. In fact there is not much Spanish beef left in Spain. Most of cattle breeds now are french industrial breeds and it is totally different meat. I’ll have to look for both the beef and the ham the next time I’m in Spain, I love jamón ibérico de bellota. youre right, here in indonesia same method to cook teriyaki beef, tough part of beef which is cheapest beef, overcooked it, taste only the sauce i cant taste the beef at all..
It’s Japanese beef, unfortunately if you live in the US you can’t buy it due to an import ban. Seems a bit too sweet to me. Perhaps a tablespoon more soy sauce or something to balance it out. Hi chef Marc, what alternatives have i got if i really cant get sake? Hi Jc, sake pretty unique amongst alcohols and so there isn’t a very good substitute. The sake has two purposes the first is as a liquid, the second is as a flavor enhancer (sake contains a lot of amino acids, which create the taste of umami). Using another alcohol like beer or wine will change the flavor of the sauce significantly, but if you’re okay with that then that’s a possibility. If you don’t want to change the flavor of the sauce, just use water. this recipe is awesome!!! i’m about to make it for my Best Friend. I am having to use a homemade soy sauce, because my best friend is allergic to soy, and so there is no actual soy in it, but more of a soy sauce substitute. I love cooking Japanese food! and we home grow our own cows, so its fresh home grown beef for me! Hi Harold, it’s great to hear that you’ve come up with a new type of teriyaki sauce, but here in Japan we do not put bones or onions in teriyaki sauce. 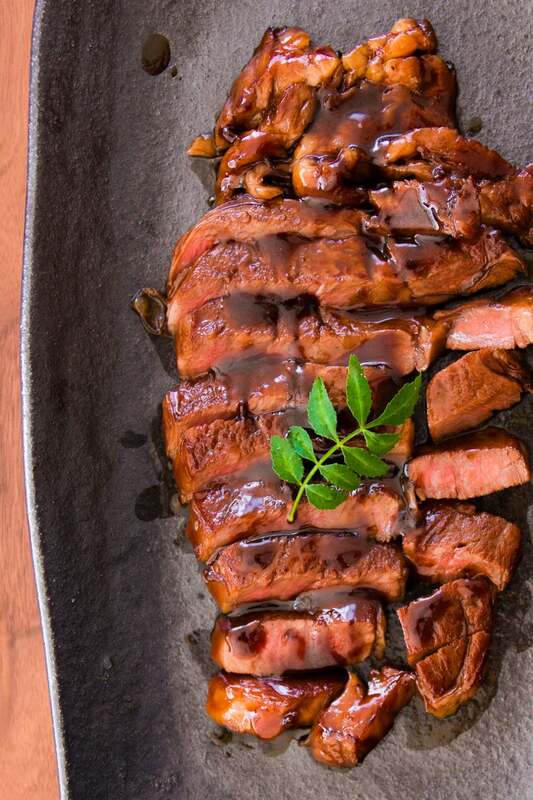 The word “Teriyaki” literally means shiny and grilled, which refers to the the translucent sheen of proper teriyaki sauce as well as the cooking method. That’s why the sauce is usually very simple containing soy sauce, sugar, sake (and possibly mirin). Adding other things to the sauce tends to cloud it, which is why it’s not usually done (i.e. no garlic or ginger). Hope that helps clear things up. That’s traditional Japanese? What’s another popular Japanese steak method? Hi Harold, not sure if you read the post but it’s all explained there. Beef teriyaki does not really exist in Japan. Teriyaki is almost always made with chicken. Japan didn’t really have a history of eating beef before the American occupation after the war. While we do have American style steakhouses here, steak isn’t really a dish in Japanese food. The closest thing is Yakiniku (grilled meat), which involves thin small pieces of beef that you grill at your table. Hi Harold, that’s not what I am telling you. Teriyaki is a Japanese method of cooking something (usually chicken, sometimes yellowtail) that describes something very specific. I’m all for creative interpretations of a dish, but if the dish gets changed in some fundamental way that the name no longer accurately describes it, then perhaps it would be best to change the name. To put this another way, if they started making cornbread here in Japan at “American” restaurants with buckwheat flour instead of cornmeal, I’d take issue with that as well since the name is no longer accurate.